The Mazda CX-3 2018 is a 5-Seater SUV with Skyactiv-G, 2.0L engine the produce 154 Hp power at 6,000 RPM and 206 Nm torque at 2,800 RPM. With 48 Litres and Direct Injection Fuel System, Mazda CX-3 fuel consumption use around 6.3 Liters per 100 Km. The car available in five color option with 6 SRS Airbags, ABS with EBD & BA, the Dynamic Stability Control system (DSC), Traction Control System (TCS) and Rear-View Camera. Inside, there is 7-Inch Touch Screen Display with Radio Tuner, Audio Jack, Bluetooth, CD & MP3 Player, and GPS Navigation. 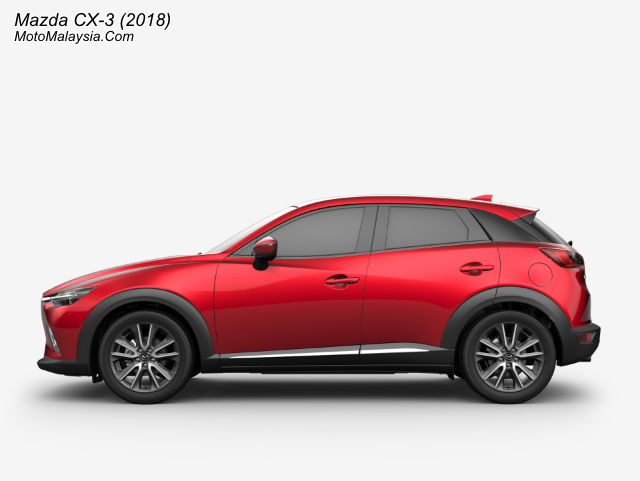 The latest Mazda CX-3 2018 Price in Malaysia is starting from RM128,159 with 5 years Warranty or 100,000km mileage.